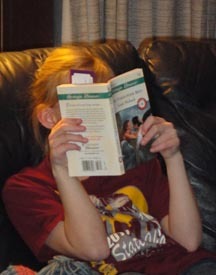 My eight-year-old granddaughter, reading her very first romance novel (my sweet traditional contemporary, The Takeover Bid -- chosen because it includes a dog named Scruffy and no actual love scenes). I'll keep you posted about how she likes it! OMG, that is TOO cute! !